Ian Field racked up a fourth National Cyclo-Cross Championship title with a dominant display in Abergavenny. The Hargroves Cycles man rode his usual race, sitting in the top ten before making a burst for the front. It was Field’s team mate Steve James who led the race out from the start with Alex Paton (Pedal Heaven RT), Liam Killeen (Specialized UK) and Jody Crawforth (Hargroves Cycles) all towards the front of the race. Killeen enjoyed a spell at the front before Field made his attack, powering away on a small climb. From then on there was no looking back for the 28-year-old, and with four laps to go and he had a 38-second gap back to Killeen and Crawforth. Killeen was comfortable in second and Lewis Craven grabbed third place, sprinting past a tiring Crawforth on the final lap. “I sat on the wheels for the opening laps, just to see what others were going to do,” said Field. “Then when I thought the time was right, I got going. In the elite women’s race, Helen Wyman (Kona FSA Factory Team) beat Nikki Harris (Young Telenet Fidea) to claim her ninth National Championship title. Wyman expected Harris to be the biggest threat on the day, and she proved to be right as the two riders went head-to-head throughout the race. An early break of Wyman, Harris and 17-year-old Amira Mellor (Paul Milnes RT) managed to pull away from the group before Mellor got dropped. Although Harris held the lead early in the race, it was a commanding performance from Wyman and she came back to take victory. Mellor eventually surrendered third place with Annie Last making a fantastic burst through the field. Speaking after the race, Wyman said: “I’m really happy with today and the ninth title. It always feels good to win a national title and I like the jersey. I don’t think anyone would recognise me in anything else! Grant Ferguson is in imperious form at the moment and he was clear favourite to take a third consecutive under-23 title. The Betch.NL-Superior rider didn’t disappoint and, after beating Ian Field to victory in the final round of the National Trophy the week before, was a comfortable winner at Abergavenny. Hope Factory Racing’s Jack Clarkson took second place and crossed the line unopposed, leading from Beeline Bicycles rider Ben Sumner. Pioneer-Scott Syncros rider Tom Craig retained his junior crown and completed a fine weekend for the Craig family. Tom’s father, Nick, won the men’s veteran race beating Jedi Cyclesport’s Ian Taylor and Ride Coventry’s Darren Atkins. His brother Charlie finished third in the under-14s. Tim Gould, who racked up a number of podium finishes in the competition as a senior in the late eighties and early nineties, returned to the Championship to win the over-50 veterans race. 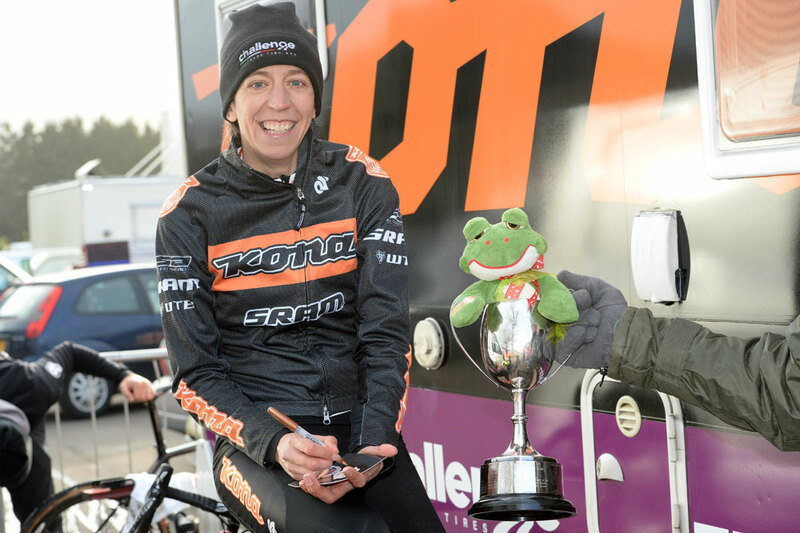 Prolific Isla Rowntree (Islabikes) added yet more silverware to her trophy cabinet with victory in the veteran women’s race, seeing off competition from Maddi Smith and Marie Jackson. In the under-16s, Dan Tulett and Sophie Thackray were the winners with Lewis Askey and Poppy Wildman victorious in the under-14s.